That hurt. A whole lot. 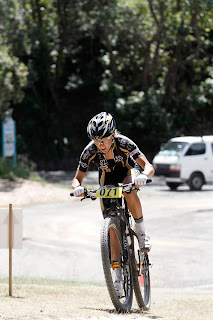 In fact, I'd forgotten just how much it hurts to race XCO format. Sure, I've played around doing odds and sods over the last couple of years but the body certainly realised that it had been a while. At the end of lap one. Wellington's Mt Vic course was always going to provide a baptism of fire. Five laps, each a smidgen over four kilometers with a mix of pinchy climbs, rooty descents, sweet drops, some stadium steps and a lap of the velodrome for amusement with the thermostat cranked up to red hot provided an uber value for money first hit out. 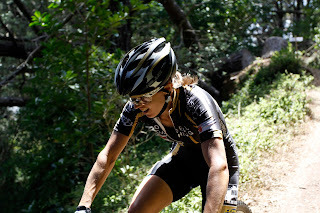 My relationship with XCO has always been a bit of a love-frustate relationship. I love it cos it was how I first started racing bikes. I still remember rocking up to a junior National Cup race being hosted by my mountain bike club in various bits of kit I had borrowed including my Mum's helmet (sorry, I don't have a photo - phew!). My brother made me borrow his clipless pedals out of fear of being embarrassed by his big sis who had no clue what she was doing. His parting advice on the startline was, "Ride as hard as you can from the gun and don't let anyone pass you" followed by "and never look back". I stuck to his game plan and surprised everyone including myself, my Mum and my little bro with a great result and couldn't be kept off a startline for the rest of the summer. Or the next one. Or the one after that. Last time I checked, no female Junior World Champ MTB XC racer has ever gone on to win an Elite World Champ MTB XC title. Julie Bresset may have changed that stat and sure, some of them that do achieve rainbow stripe glory move to road racing (like my fellow countrywoman Nicole Cooke) but nevertheless it goes to show the transition to senior racing is a tough move to pull off. I never got close to winning a major junior international championship (my best was 16th at Worlds, in the Southern Hemisphere funnily enough) but I was even further away from where I thought I should be in my first season of elite racing and bailed after half a season for a whole number of reasons. I had another stab at it in 2006 with a calendar of National racing interpersed with full time doctoring and military deployments and came out with a bronze medal at the British Elite XC Champs and finished my only World Cup race without being pulled out under the 80% rule at Fort Bill. I decided that I was probably never going to ride quite as quick as I wanted and downgraded my racing aspirations. In hindsight, it was probably a tad premature to make that call but I've never been a particularly patient person. This year, seven years after my last elite outing and following a winter of dabbling in riding at pace in the mud with a whole heap of encouragement (plus some back rubbing) I took the plunge to get on an elite XCO startline again. The rentacrowd at the summit of the climb made it worthwhile in itself! There was an awesome buzz while an exciting women's race unfolded and I almost snuck on to the podium with some class company. Now that I've started it would be kinda rude to stop without giving it a good go. So, this time I'm in for the long haul. Even more than one season. I reckon, at least until I turn forty - which seems like a reasonable milestone.